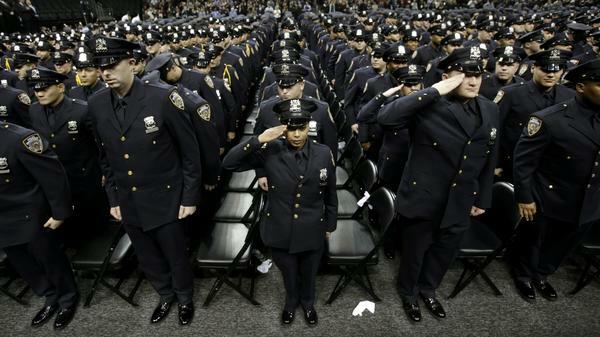 A New York City police academy graduation ceremony on Dec. 28, 2012, where Mayor Michael Bloomberg announced that the New York murder rate has hit an all-time low. While some point to the NYPD's policing tactics to explain the decline, others say economic and demographic shifts are also at work. "I live alone here. So more cops, more safety," says Ajar Isabekova, who works behind the counter at Sultan Meat and Deli in Sheepshead Bay, Brooklyn. When she leaves her job each night around 10 p.m., "I see on every corner police workers, and I feel safe," Isabekova says. Citywide, New York's murder rate was down 18 percent compared with 2011 — and a remarkable 80 percent compared with the bad old days of the early 1990s. 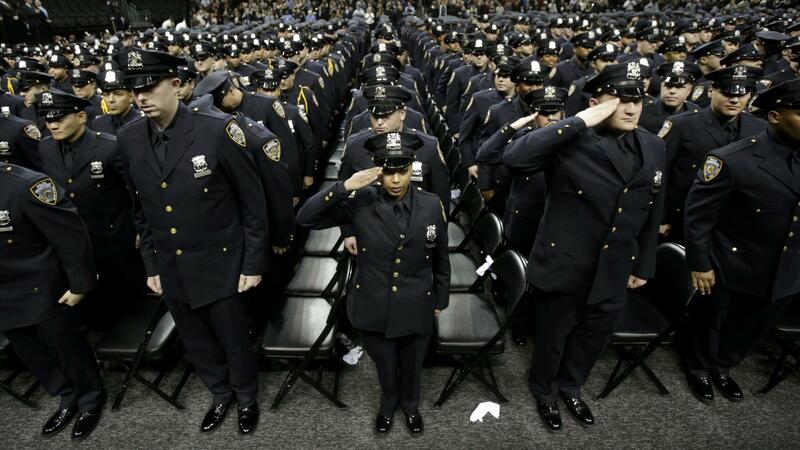 "The number of murders this year will be lower than it has been at any time since records started to be kept some 50 years ago," Mayor Michael Bloomberg noted at a graduation ceremony for New York Police Department recruits in December. The numbers for New York are especially striking compared with cities like Chicago and Detroit, which saw their murder rates go up last year. But experts urge caution about jumping to conclusions about what is really happening in New York. It's a mistake to think that the cause for yearly murder rate fluctuations always lies in specific policies, says Franklin Zimring, a law professor at the University of California, Berkeley, and author of The City That Became Safe: New York's Lessons for Urban Crime and Its Control. "If you're gonna make the assumption that changes in crime rates always are responding to policies," Zimring says, "then why shouldn't we be blaming the police for the slight increases [in New York's murder rate] in 2010 and 2011?" The NYPD declined interview requests for this story, but police Commissioner Ray Kelly has frequently tied the drop in shootings and homicides to the department's aggressive tactics — including the controversial practice known as "stop-and-frisk," in which police officers can stop, question and frisk anyone they consider suspicious, without a warrant. "If anybody doesn't think stop-and-frisk played a role here, they're fooling themselves," says Martin Golden, a former New York police officer who now represents South Brooklyn in the state Senate. "Stop-and-frisk gives you the ability, if you see something — you know, a bulge, you see somebody moving in a certain direction — you would be wrong not to jump on that individual, not to toss that individual." But critics of the practice say stop-and-frisk violates the Constitution and question whether it's necessary to fight crime. "If you look at the 50-year perspective, there are cities across the spectrum [where] crime rates have gone back to what their 1960 levels were, without having to resort to these tactics," says Jeffrey Fagan, who teaches law at Columbia University. Fagan says other big cities like Los Angeles and Houston have also seen violent crime decline to levels not seen in decades. "Some of them are using targeted hot-spots policing — problem-oriented policing where they identify particular crime locations — you go in and try to reduce the opportunities for crime in those places," Fagan says. Sometimes, he adds, that's just a matter of putting more police on the streets as a visible deterrent. New York has used all of those tactics, too. But Fagan thinks policing is only part of a much bigger story — one that includes the gentrification of inner cities and the end of the crack epidemic. "These are big social forces, big economic forces, big demographic forces," says Fagan. "I think it's a bit of a conceit to think that what the police can do can actually have the kind of leverage to move the needle on crime up and down." But as long as New York's murder rate continues to decline, many will continue to wonder what the city is doing right — and what, if anything, other cities can learn from it. When it comes to violent crime, the nation's biggest metropolis is safer than it has been in half a century. There were 418 murders last year in New York, a city of more than eight million people, and that is the lowest total since the early 1960s. As to the reason why and who should get the credit, well, there's debate about that, as NPR's Joel Rose reports. JOEL ROSE, BYLINE: No part of New York saw a more dramatic decline in murders last year than the 61st Precinct. UNIDENTIFIED WOMAN: Give me one more meat and another potato. ROSE: The Sultan Meat Market and Deli is on the ground floor of a high-rise in Sheepshead Bay, a middle-class neighborhood in South Brooklyn. Ajar Isabekova works behind the counter. She says she feels safe in the neighborhood even when she leaves the store late at night. AJAR ISABEKOVA: All the time when I come walk to my job, it's about like 10 o'clock, I see on every corner police workers and I feel safe. And I live alone here, so - more cops, more safety. ROSE: Two years ago, there were 14 murders in the precinct. Last year, it had only three. Citywide, the murder rate dropped 18 percent compared with 2011, and a remarkable 80 percent compared to the bad old days of the early 1990s. New York Mayor Michael Bloomberg has been happy to talk about that decline, as he did at a graduation ceremony for New York Police Department recruits last month. MAYOR MICHAEL BLOOMBERG: The number of murders this year will be lower than it has been at any time since records started to be kept some 50 years ago. Yes, they deserve a round of applause. ROSE: The numbers for New York are especially striking next to those for cities like Chicago and Detroit, which saw their murder rates go up last year. But experts say we should be cautious about jumping to conclusions about what is really happening in New York. FRANKLIN ZIMRING: Homicide goes down and the mayor turns to his police chief and he says, hey, what did we do last year? It worked. ROSE: Franklin Zimring is a law professor at UC Berkeley, and the author of a book about New York, called "The City That Became Safe." He says it's a mistake to think that yearly fluctuations in the murder rate always have a cause in specific policies. ZIMRING: If you're gonna make the assumption that the changes in crime rates all was responding to policies, then why shouldn't we be blaming the police for the slight increases in 2010 and 2011? ROSE: The NYPD declined interview requests for this story, although police commissioner Ray Kelly has frequently tied the drop in shootings and homicides to the department's aggressive tactics, including the controversial practice known as "stop-and-frisk," in which police officers can stop, question and frisk anyone they consider suspicious, without a warrant. Polls show that the practice has support from a majority of New Yorkers, including former police officer Martin Golden, who's now a state senator representing South Brooklyn. STATE SENATOR MARTIN GOLDEN: If anybody doesn't think stop-and-frisk played a role here, they're fooling themselves. Stop-and-frisk gives you the ability, if you see something, you know, a bulge, you see somebody moving in a certain direction, you would be wrong not to jump on that individual, not to toss that individual. ROSE: But critics of the practice say stop-and-frisk violates the Constitution and that it's not necessary to fight crime. Jeffrey Fagan teaches law at Columbia University. He says other big cities like Los Angeles and Houston have also seen violent crime decline to levels not seen in decades. JEFFREY FAGAN: If you look at the 50-year perspective, and there are cities across the spectrum that their crime rates have gone back to what their 1960 levels were, without having to resort to these tactics. Some of them are using targeted hot-spots policing, problem-oriented policing where they identify particular crime locations, you go in and try to reduce the opportunities for crime in those places. ROSE: Fagan says that's sometimes a matter of just putting more police on the streets as a visible deterrent to crime. New York has used all of those tactics, too. Though, Fagan thinks policing is only part of a much bigger story, one that includes the gentrification of inner cities and the end of the crack epidemic. FAGAN: These are big social forces, big economic forces, big demographic forces. I think it's a bit of a conceit to think that what the police can do can actually have the kind of leverage to move the needle on crime up and down. ROSE: But as long as the murder rate continues to decline, it's inevitable to wonder what New York is doing right and what, if anything, other cities can learn from it. Joel Rose, NPR News, New York. Transcript provided by NPR, Copyright NPR.